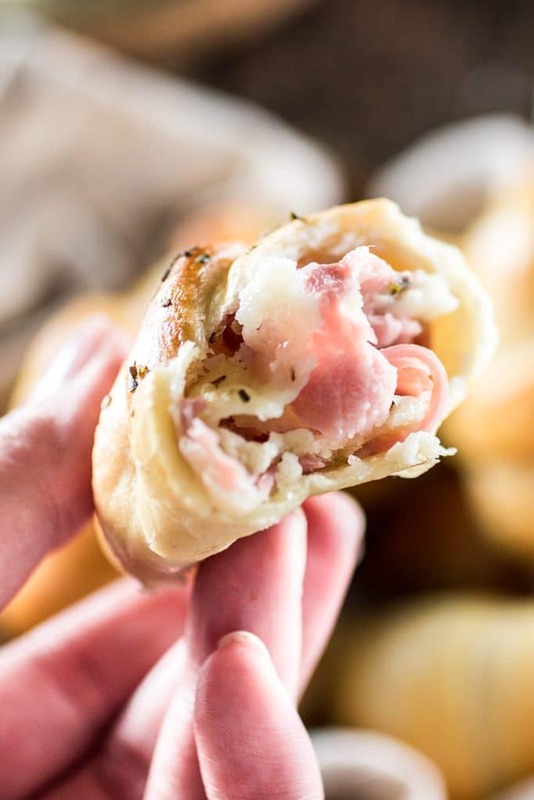 These Brazilian Ham and Cheese Rolls taste like childhood to me! So I thought they would be perfect for Back-to-School. 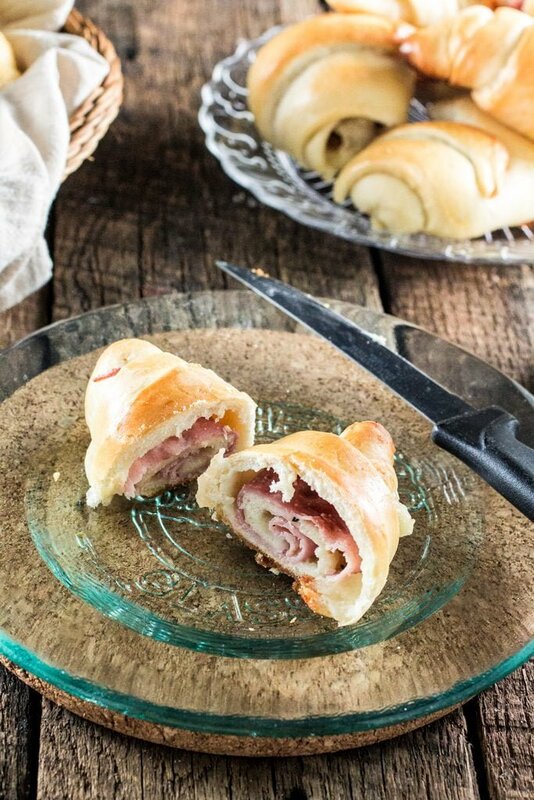 A thousand years ago, when I was a child, I used to eat a lot of these delicious Brazilian Ham and Cheese Rolls at school. My mom didn’t have the habit to pack us lunch, so me and my brother would buy food at our school’s cafeteria. In her defense, she tried to send us homemade sandwiches, but bringing your own food to school was “lame” back in my days, so we convinced our parents to buy the “food money” for the cafeteria. I remember how happy I was when my dad handed me the little orange pad of “fake money” that said “pizza”, meaning we could exchange those tickets for pizza. Pizza for lunch? Woohoo! Other than pizza, he also used to get us the “salgados” pad, which means “snacks” in Portuguese. Coxinhas (Brazilian Chicken Croquettes), potato rolls filled with Brazilian cream cheese, sfihas (little Lebanese meat pies) and, of course, enroladinhos de presunto e queijo (the classic little ham and cheese rolls). Now, tell me, who wouldn’t be excited for lunch break in school with those options? Nowadays, as we are more aware of what we put in our bodies – and in our children’s – I doubt someone would let their kids eat pizza (or fried croquettes) for lunch every day. Most of the moms I know pack their kids’ lunch and I haven’t heard any kid complain that bringing lunch to school is lame or tacky, like we used to. However, kudos to those moms that are able to pack a nutritious meal that is also tasty. What’s the point of packing salad with tofu if your child is not going to touch it and will end up sharing some Oreos with a generous (or too distracted to notice a thieving hand) friend? Keeping the kids happy AND healthy is one hard task, I’ll say. And that’s why I’m here to help you today! 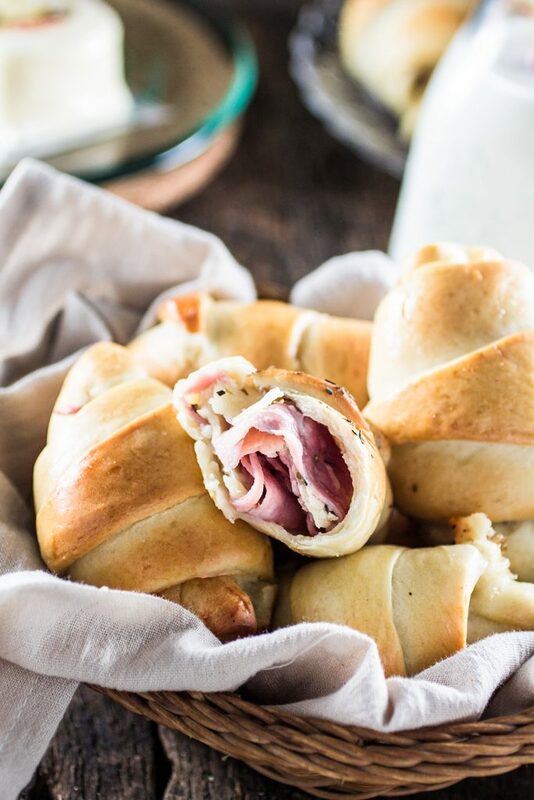 These ham and cheese rolls are actually good for you, if consumed in moderation, and the kids will go nuts about them. They have a good serving of protein, dairy and carbs. If you pack some fruit and some salad or veggies to go with it, then your child is having a well balanced meal that they won’t switch for any cafeteria greasy pizza! What is the difference between these Brazilian Ham and Cheese Rolls and regular ham and cheese rolls? Probably not much! 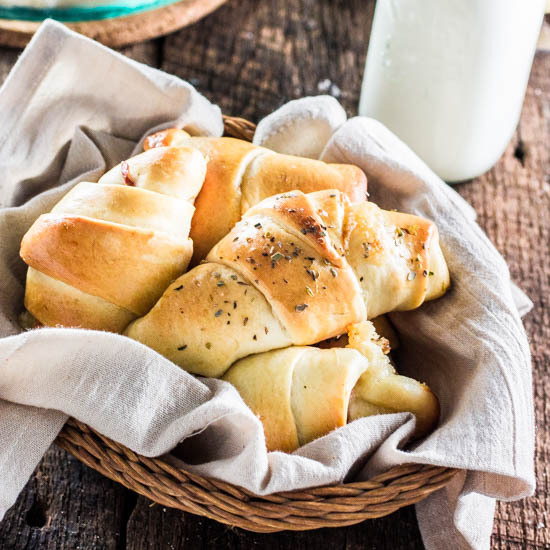 I am calling them Brazilian because I am sharing how it is usually made in Brazil, including an easy recipe for the dough. Other than that, it doesn’t have any “exotic” ingredients in it. People often mistaken Brazilian cuisine as a branch of hispanic or caribbean cuisines, but they forget our main influence is european. Think Portuguese bread and pastries and you will begin to understand Brazilian food! It is more hearty than spicy, for sure. This recipe makes about 20 small rolls. They will keep in the fridge for a couple of days and you can either eat them at room temperature or reheat them in the oven. I’m not a fan of freezing cured meats, like ham. I just think it alters the color and texture. However, if you don’t have a problem with that, you can bake your rolls for 10 minutes and then freeze them for up to 3 months. When ready to eat them, bake for the remaining necessary time or until they are golden brown and cooked through! These are truly a great snack for on-the-go or even to serve for breakfast! I hope you guys give it a try and come back to let me know how crazy in love you are with them!! In your stand mixer bowl, mix the yeast with the sugar and the warm water. Stir and cover the bowl with a kitchen towel, letting the yeast proof for 10 minutes. Add the oil and the salt and stir to combine. Bring the bowl to the stand mixer, fitted with the dough hook. With the mixer running on low, add the flour slowly, letting the mixer work until you have a cohesive dough. Turn the speed up (medium high) and let the mixer knead the dough for 6 to 8 minutes, until the dough is elastic and smooth. Brush the dough with oil, cover with the kitchen towel and bring to a warm place to rest. (I usually put it in my microwave!) The dough should rest for at least one hour or until it has doubled in size. Preheat oven to 350 degrees and prepare two large baking sheets, spraying with cooking spray. Using a rolling pin, roll each part into a rectangle (about 12 inches) and cut 10 equal triangles from each dough half, 20 total. You can use the scrapes and roll to cut more triangles if necessary! Layer one slice of ham and one slice of cheese per triangle and finish by sprinkling oregano to taste. Roll each triangle from the widest part to the narrowest and place on the previously prepared baking sheets. 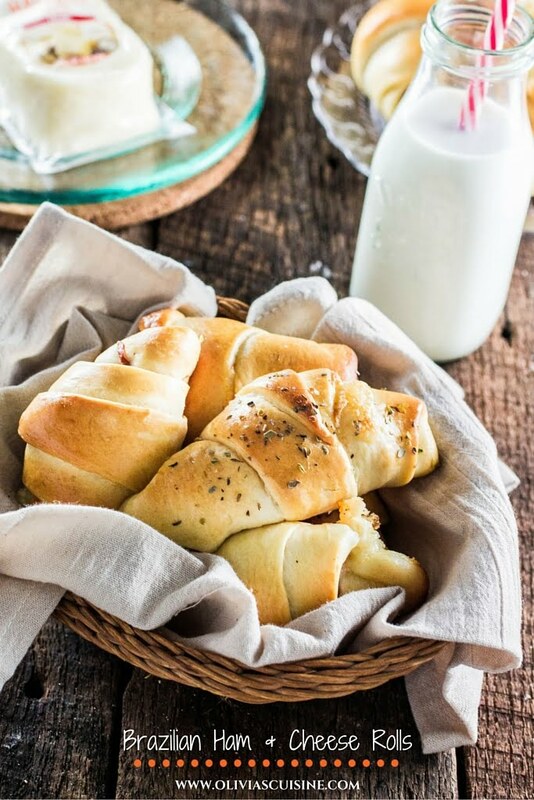 In a small bowl, whisk the egg with the water, making an egg wash.
Brush all the rolls with the egg wash, sprinkle them with some more oregano (optional), and bring to the preheated oven for 20 minutes, turning the baking sheet halfway through, or until they are golden brown. Check post for freezing suggestion. This looks DELICIOUS! I love a good savory breakfast, and the addition of the dried herbs is super smart. These look delicious! I love that you make your own dough too, makes such a difference. This recipe is very good, I’ve done a few times, thank you! I’m very happy you enjoyed them, Angela! I could go for some right now. I guess it’s time to make another batch! :) Thanks for taking the time to leave feedback. I really appreciate it! This recipe is so good, I’ve done a few times, thank you! Made these today and they are great! Next time, I’ll add even more ham (or at least not thin-sliced ham!) and more cheese (my slices were too thin and didn’t go to the edge of the dough), and I’ll try to pinch the edges shut so that the cheese doesn’t leak out. I also added some freshly cracked black pepper and sea salt to the tops of my second batch and I found that really enhanced the flavour. Question: how do I store leftovers? In an airtight container in the fridge? Or out? Thanks! Delicia, I loved the site I’m going to tell my friends. Make mouth water. Super recipe. Delicious, excellent recipe, thank you and congratulations!!! I love bread and I loved this recipe, thanks for sharing.